Vehicle overtaking, also known as 'passing,' is changing lanes or driving around another vehicle to move past a slower vehicle. 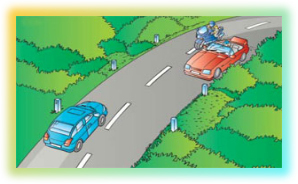 Do not overtake other vehicle unless you are sure that you can do so without placing yourself in a dangerous position. Following are the guidelines of overtaking. • The lane designated for faster traffic is on the right. • The lane designated for slower traffic is on the left. • Overtaking is permitted to the right. Use the right-turn indicator to signal that you want to overtake. Be sure the way ahead and behind is clear before overtaking. Check out for scooters or motor cycles that may be hidden from view in front of the vehicle you are about to overtake. Watch for vehicles in front that may be turning right. Watch for vehicles in front that may be turning right. Immediately after overtaking, give indicator that you want to get back to the same lane. Get back to the previous lane when you can see all the front of the vehicle you are passing in your rear view mirror. Do not cut off a vehicle by suddenly moving in front of it. Never overtake when you do not have a full view of the road ahead. Never race if the vehicle you are passing speeds up. In this situation get back into your original lane. Note:- Never overtake within 30 metres of a pedestrian crossing. While driving on roads with more than one lane, lane changing may be required to overtake another vehicle, to avoid a parked vehicle or when the vehicle ahead slows to turn at an intersection. Proper signal or indicator is very important while changing lanes to ensure safe move. Check out for a space in traffic where you can enter safely. Re-check to ensure the way is clear and that no one is coming at a fast speed from behind. Note:- Never change the lane suddenly by cutting in front of another vehicles. Avoid lane change unless required and do not change in or near an intersection. As you approach a vehicle from behind, switch your headlights to low beams. To warn the driver ahead for overtaking switch your high beams on and off quickly. Check your mirrors and blind spot perfectly, and pull out to overtake. While moving beside the vehicle, switch on your high beams so that you can see more of the road ahead. Watch out for the vehicles that may be turning right in front of you. When you are able to see all of the front of the vehicle you are overtaking in your rear view mirror, pull back into the previous lane. Give indicator to ensure other drivers that you are getting back into the lane.